By the order of OOO Stroyengineering IPEC manufactured continuous mode pyrolysis plant TDP-2-800. The delivery of the unit was made just two months after signing the contract. Assembly time at the site will be kept to a minimum, by virtue of the build quality of TDP-2-800: three assemblies fit into the dimensions of a standard 40 ft’ containers, which facilitates the transportation of the equipment. Thermal Decomposition Plant TDP-2-800 will operate within the scope of an industrial facility for conversion of coal washing refuse, coke and by-product process waste into oil, fuel additives and carbon sorbents. The key task of the facility is treatment of tar pits, areas of accumulation of by-product coking industry waste. Presently, these ponds are located in the critical vicinity of the city and constitute environmental hazard. 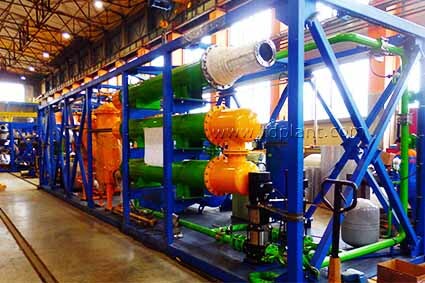 Pyrolysis plant TDP-2 at this point is the only available technology for the treatment of chemical-recovery industry waste, which allows extracting valuable secondary output from it. The efficiency of the technology was confirmed by the test conducted at industrial site of BTA plant where IPEC production facilities are concentrated. Test batch of raw material processed has yielded positive results.